Hatsune Miku -Project DIVA- on the Tokyo Game Show! 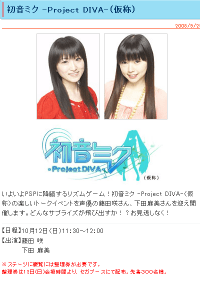 A talk show with two of my favorite voice actresses! It also suggests Rin will make an appearance in the game. Pingback: Kyouran Kyodai » Costumes for My DIVA?